After two three-year old girls were raped and murdered in rural Mississippi, law enforcement pursued and convicted two innocent men, Kennedy Brewer and Levon Brooks. Together they spent a combined 30 years in prison before being exonerated in 2008. Meanwhile, the real killer remained free. 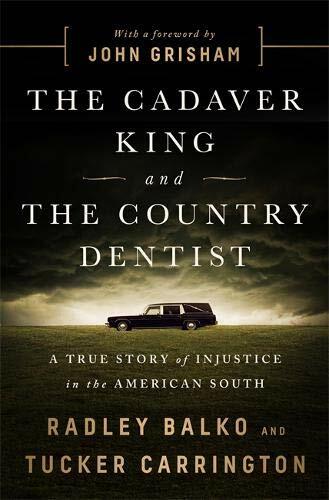 The Cadaver King and the Country Dentist: A True Story of Injustice in the American South, co-authored by Radley Balko and Tucker Carrington, recounts the story of how the criminal justice system allowed this to happen, and how two men, Dr. Steven Hayne and Dr. Michael West, built successful careers on the back of that structure. For nearly two decades, Hayne, a medical examiner, performed the vast majority of Mississippi’s autopsies, while his friend Dr. West, a local dentist, pitched himself as a forensic jack-of-all-trades. Together they became the go-to experts for prosecutors and helped put countless Mississippians in prison. But then some of those convictions began to fall apart. Radley Balko is an opinion writer and investigative reporter for the Washington Post and authored two books that includes Rise of the Warrior Cop (2013) and The Militarization of America’s Police Force (2013). Tucker Carrington is criminal defense lawyer and director of the George C. Cochran Innocence Project at the University of Mississippi. This books main focus is on Steven Hayne’s and Michael West’s roles in the trials of Kennedy Brewer and Levon Brooks, both men were wrongly convicted and eventually exonerated in the sexual assault and murder of two children in the 1990s. With keen insight the authors methodically dissect Hayne’s and West’s false and misleading testimony and pin point major flaws in the prosecution’s case. Of course, it is not just these two men at fault here. They argue that bad forensics, blatant racism, greed, and systematic institutional failures are fundamentally at fault in this case and many others, and these failings have raised thought provoking questions about Mississippi’s ability and willingness to address these central problems. In this riveting new exposé Balko and Carrington have detailed the fundamental flaws of the broken Mississippi criminal justice system, which is a relic of the Jim Crow era. They reveal that the root of police misconduct lay in corrupt political maneuvering and the justice system's reliance on shaky expert testimony. Because prosecutors were primarily interested in pushing cases off their dockets. They relied on flimsy and dishonest testimony to guarantee quick convictions for black defendants rather than identifying the actual perpetrators. How this occurred for so long, unrestrained and unapologetic, is perplexing. The Cadaver King and the Country Dentist is a wide-ranging and explosive investigation of a racist criminal justice system that allows for the tragic exploitation and incarceration of black people in Mississippi. With detailed and wide-ranging storytelling techniques, Balko and Carrington build a hard-to-ignore case for comprehensive criminal justice reform. This book is certain to give pause to even the most ardent supporters of law enforcement and is a wake-up call to anyone who thinks police militarization and brutality isn't a political issue.